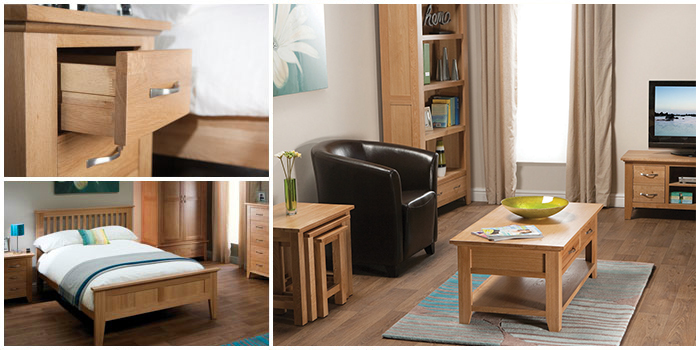 The Camberley Range features an extensive choice of quality oak furniture pieces that are ideal for rooms across the home. The Camberley collection boasts quality solid oak frames and oak veneered panels with a beautiful light oak finish that blends with all interior designs. Key features of the Camberley design are tapered shaped legs and pediments, brushed steel handles and dovetail joints. A tough and hard-wearing lacquer finish protects the light oak and adds a glossy shine to all pieces. With as many as 60 pieces to choose from, The Camberley Range has furniture fit for all rooms across the home. Indeed, practicality and versatility are other key benefits of the collection. Many of the pieces in the range could easily have several uses around the home and can be employed in different ways according to your needs and tastes. The Camberley Oak sideboard pieces are perfect to complete the look in a dining room, but can just as easily be placed in the living room or hallway to good effect. The Camberley Oak Lamp Table also makes an ideal bedside table, and you will see similar examples of adaptability across this range of impressive light oak furniture. With a wide number of pieces to fit the dining room to the living room to the bedroom, you will find a Camberley piece of all types of conventional home furniture. In addition to this, there are some slightly more unusual pieces on offer, such as the Camberley Oak 1 Hole Cube or 2 x 4 Hole Cube, that provide distinctive display options for the home. Versatile, adaptable and stylish, the Camberley range has it all.